WINNIPEG - A solid result in December of 635 MLS® unit sales and a dollar volume over $179 million capped off a successful year in 2017. 2017 finished up strong with a total of 13,525 sales, down less than 1% from the record year of 2016 where 13,632 sales were transacted. A new annual dollar volume record was set in 2017 with $3.92 billion worth of MLS® sales – an increase of close to 4% in comparison to 2016. A byproduct of 2017 which has been noted before, is the many affordable options available to buyers in the WinnipegREALTORS® market region. It became very apparent early on in 2017 that buyers were making adjustments within certain property type categories or between them to attain their dream of acquiring a place to call home. “Within the many neighbourhoods of Winnipeg or the outlying rural municipalities in the capital region, buyers made informed choices and took advantage of one of the most affordable residential real estate markets in the country, “said Sonnichsen. 2017 was a year where stronger move up market activity helped offset some drop off in the first-time buyer price ranges for single family homes. One clear example of higher end sales gaining ground over 2016 was the fact there were 45 million dollar plus homes sold in comparison to 30 in 2016. Even condominiums saw a spike in million dollar plus sales with 6 compared to none in 2016. More move up sales activity in 2017 was a contributing factor in lifting the annual average sale price upward for both residential-detached and condominium property types. The residential-detached average sale price went from $302,726 in 2016 to $315,720 in 2017. The condominium average sale price rose over $9,000 to $244,687 in 2017. Residential-detached average sale prices for the MLS® zones of Winnipeg and rural municipalities outside the city show price gains over 2016 with only Winnipeg North decreasing slightly. The southwest zone eclipsed an average sale price of $400,000 in 2017 for the first time. When you have over 300 sales in one MLS® area (Waverley West) in this zone having an average sale price of $546,664 you know it will skew the entire zone’s average sale price higher. This MLS® zone also includes Tuxedo which had an average sale price of $853,378. Speaking of residential-detached sales in 2017, despite the sales gains noted in higher price ranges, over half of all sales still occur under $300,000 with the busiest price range from $250,000 to $299,999 commanding a total market share of 21%. It is worth noting the $300,000 to $349,999 price range for the first time in 2017 supplanted the $200,000 to $249,999 price range as the second most active price range. The average days on market to sell a home in 2017 was 29 days, 2 days quicker than 2016. The highest sale price for homes was $2,460,000 with the lowest selling for only $10,000. The most active price range for condominium sales in 2017 was from $150,000 to $199,999 at 28% of total sales. Another 35% of condo sales occurred fairly evenly in the next two higher price ranges from $200,000 to $249,999 and $250,000 to $299,999. The average days on market to sell a condo in 2017 was 43 days, 4 days quicker than 2016. The highest sale price for condominiums was $1,575,000 while the lowest was $42,000. Some other property types did not take a backseat to residential-detached and condominiums in 2017. In fact they outperformed them in terms of sales increases over 2016. Single-attached properties had a double-digit increase of 12% to finish at 537 sales and a 4% market share. Town houses showed the largest sales increase of them all at 19% while commercial jumped 8%. Residential-detached sales were actually down 2% from 2016 and condominiums which started off the year with high monthly percentage gains over 2016 finished up with an increase under 3%. 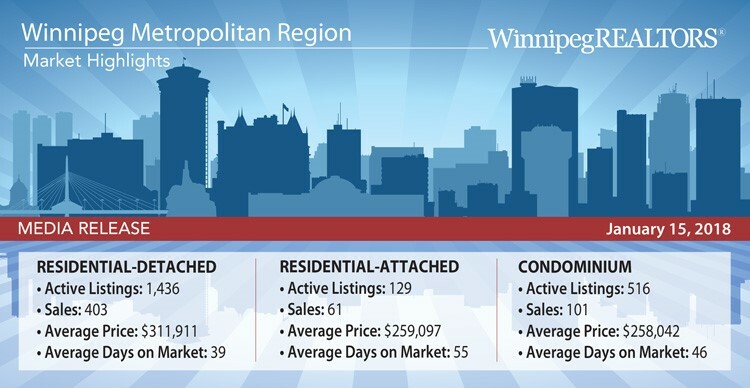 Condominium sales were only 9 sales short of the annual record set in 2014 when 1,798 sales were transacted on WinnipegREALTORS®’ MLS®. 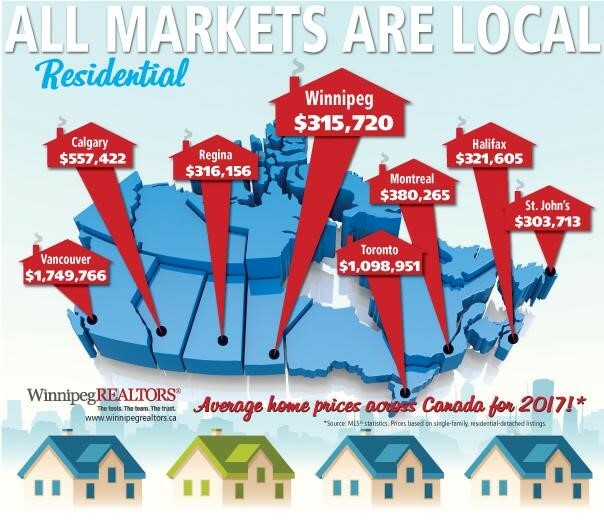 “What these different property type outcomes illustrate is how important it is to consult with a REALTOR® - your local market expert – on what is happening with respect to your specific property type and how you need to navigate the market to get the best results,” said Marina R. James, CEO of WinnipegREALTORS®. WinnipegREALTORS® will get into more detail with analysis and explanation of what happened in 2017 when it hosts its 12th Annual Forecast breakfast on February 7, 2018. It will also look ahead to what it expects to happen in 2018 with new federal mortgage lending guidelines, the potential of more Bank of Canada interest rate increases and municipal elections.